Looking back at conferences I have attended, I seem to remember little about the large themes, but so much about the people I actually got chatting to – sometimes in the scheduled tea/coffee breaks, sometimes over lunch, sometimes at the conference dinner and sometimes while deciding to miss part of the scheduled programme (and yes I admit to feeling slightly naughty for ‘skiving off’). These conversations (some of them struck up because of me seeing the other person give an inspirational paper, some through the simple coincidence of sitting next to each other) have led to me making changes to my practice, but also long-term collaborations. Having the time to talk to each other is so valuable, but in today’s Education context this seems to become a more and more precious resource. Whenever I get to plan a conference or workshop, I have always tried to build in some extra time to just chat – whether that is a long lunch or (as in the case of the 2017 ReGenring conference) even an afternoon sharing session without formal programming. Sometimes this leaves attendees a bit surprised – there’s nothing planned? they say. Actually, there is something planned, the plan is to give YOU the opportunity to start to react to the all the content we’ve already thrown at you, to start digesting, and this works best if we can allocate some time for that. I was absolutely delighted to be at a residential conference/course last September, where a whole day was declared a ‘Day of Conversation’ with the brief for us to go out and finish the conversations we had started with other attendees and start the conversations we hadn’t had yet, but really wanted to have. Partly this became an Unconference – people forming little groups around subjects, and partly this was tiny groups of two or possibly three people sitting together talking to each other – and if any of the others were like the conversations I had, they were scheming and laughing – making lifelong friends with people you had only met three days before and laying the ground work for future collaborations. And so, the Academic Afternoon Tea was born. Loosely structured by the three traditional courses of savouries, scones and sweets, this will give us the opportunity to explore subjects, share practice and network. The first one is open for booking now – join us at LEAF in Manchester, UK on 10th May 2019 to explore ways that principles of experience design can help thinking differently about students and our own roles! There will be tea, food, some guided creative activities (we might even start with the ever popular making of our own name tags) and – most importantly – lots of time to chat. To get your ticket, check out the EventBrite page here. Yesterday I went on a little daytrip up to Glasgow. This was a fairly short notice affair after I had spotted a seminar intriguingly titled ‘Troubling the Academic Thesis – An Artist Teacher Public Seminar’ via Twitter. It promised the perspectives of Dr Chris Dooks, whose doctoral work included sound presented on three vinyl records, including sleeve notes with an essay on one side and story-board like image sequences on the other – find out more at his Idioholism website -, and Dr Nick Sousanis, whose thesis was developed and presented as the comic book/graphic novel Unflattening (Nick skyped in from Calgary). It was a really interesting conversation organised by colleagues from the University of the West of Scotland, which provided a lot of food for thought. This is surely to become one of the quotes I use all the time when talking about my teaching practice and Tactile Academia. I don’t know whether I agree with the three phases of knowledge they point out (I’m planning to read the book soon to find out), but what I really like about it is that it emphasises the idea, no the necessity, of transformation within knowledge and knowledge making. This is something that came up over the course of the seminar again and again (or maybe it is just something that I picked up on particularly because for me another PhD was in the mix, I am currently reading Stephanie Black’s PhD thesis on Illustration as a form of practice-led research, which highlights similar issues). So, there is the process of doing research (in this case doctoral study of some kind), and then there is the finished product that is presented. Within the creative practices there is an ongoing discussion as to whether the academically written thesis should be a required product. I think there is a lot of insecurity about writing in particularly and there seem to be some insecurities as to whether one is (or maybe even we all are) ‘good’ enough to claim our place in the academy (whatever that might be). Very often it seems to me that writing in this case is cast as the obstacle – and usually here writing seems to mean putting together an academically written exegesis, ignoring the potential of writing as a process. This made me think back to my own PhD thesis, which was a straight academic thesis based on some action research done through teaching, so one could argue it was practice-based, but you couldn’t really call it based on creative practice. One of the things this explored was the importance of writing for designers (and design students). While I was writing this I was concerned by a movement that seemed to try to almost get rid of writing within art and design disciplines, putting forward the photo essay and dissertation. I was concerned by this because the process of writing is incredibly useful in order to develop your thinking – as is the process of sketching (as Nick showed by sharing some of the development work of his comic not just with us at the seminar, but also in the notes/appendix section in the published book) and making other work (as Chris talked about). At one point Chris stated that a lot of the words that he wrote didn’t make it into his thesis (he decided to write a thesis to go alongside the work). I was thinking: “well, of course not!” I bet not all of the things he produced as part of his practical exploration made it onto his LPs either. This is the process, the knowledge going through the different phases – only a fraction ends up in the product to be presented. I’m a big fan of the concept of regenring (as explored by Dr Fiona English and mentioned elsewhere on this blog), and I think that works so successfully because it changes the phases of knowledge – but also because it is a process that generates more work, work that will not necessarily end up in a final piece. So maybe the problem here is this weird ambiguity that seems part and parcel of traditional (Western?) educational systems: there is the learning that is all about the process on the one hand and then there is the ‘thing’ that gets presented and evaluated. At times these seem so apart that they could almost be called a dichotomy. Which is tragic, really. So maybe we should try to put the process of research first and the ‘product’ (i.e. the physical outcome) last. Because the latter should develop out of the former. Don’t worry about finding an innovative or alternative way of presenting your research, find the most appropriate way of presenting the outcomes of your research. That might be through academic writing, or it might be something else. But on the way there, explore the different phases of knowledge (and here writing can be your friend!) and then see in what phase it seems to want to stay. I would argue that is what both Chris and Nick did. 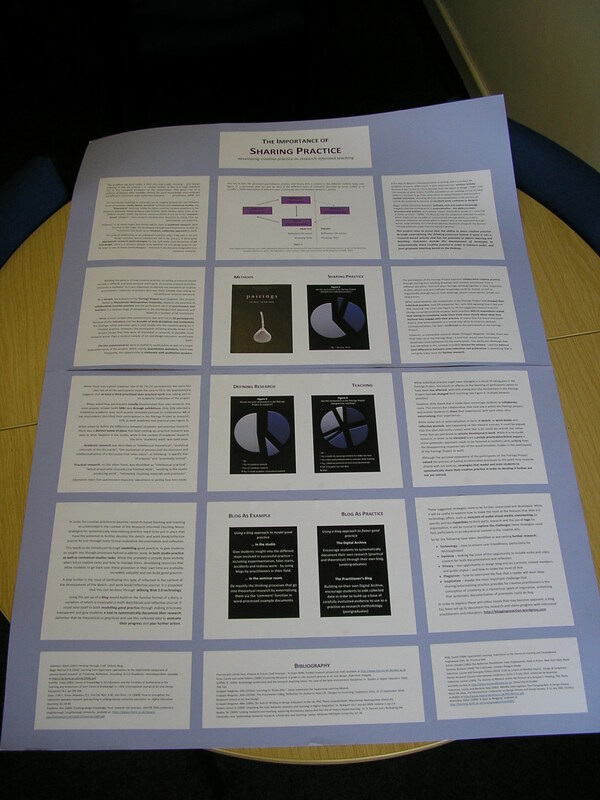 And then came the time when I had to do a research poster myself, as part of my teaching qualification. I had great plans to do it differently – not much text, very visual, surely that was the way to go. Alas, I stumbled across a problem: this was the only assessment for a module, and while I had about ten minutes to present it, basically the poster was where I had to prove all my knowledge of the subject. So it got more and more filled up with text while my good intentions stood by feeling powerless; it felt a bit like squeezing all my findings onto an A1 sheet (or however big it was). Looking at it then, I thought this was a bad poster, but at least it showed off the research I had done. Looking at it now, I think it was a really bad poster. The feedback I got mainly was about the content, although it also stated “The graphs on the poster had a positive visual impact from a distance, however, larger fonts or at least headings would enhance the accessibility of the message.” and then “The quantity of information within the poster could be reviewed” (which I am guessing means PUT LESS TEXT ON IT). Some time later I would come across ‘Spineless Classics’ – a company that designs whole books onto a one sheet poster by the way of pretty miniscule type. In a way research posters remind me of that, trying to squeeze your whole report onto A1 (or A0). But the brilliant thing about Spineless Classics is that they design their layouts in a way that you also end up with an image of (usually) white space that is significant to the book in some way. (You can see some examples here.) Research posters often don’t have that saving grace! 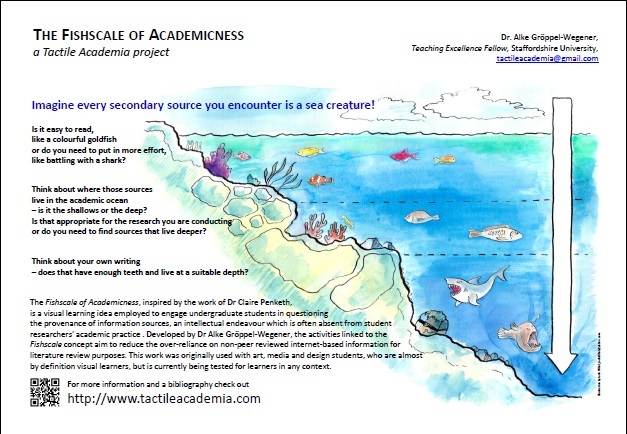 Trying to find out more about the academic research poster – and how to put together a good one – has been a bit challenging, I haven’t been able to find any good guidance beyond the basics that relates to the arts and humanities, maybe because it is more common in the (natural) sciences. But I think that this is an important aspect of practice for any research student – they might get the opportunity to submit a poster to a conference, after all, or just want to develop a visual way to show the development of their project(s). After getting a bit of funding from my university, I was able to invite visual journalist Lulu Pinney to do a lecture and workshop about research posters for us, which was very well received, incredibly inspiring and I can only recommend. Lulu gave us a lot of practical tips on how to organise a poster, but I think the most important was her mantra to “ignite, don’t immerse”. A poster shouldn’t be a summary of your research, it should ignite people’s interest in your research. I think this is fabulous advice when it comes to designing a poster for a conference. Unfortunately, however, this could turn out to be terrible advice when it comes to preparing a research poster for assessment. If a poster is the only thing that is assessed, you might have to design it very differently. So maybe the split personality of the research poster comes from us lecturers trying to adjust the ‘assessment mix’. At university we want to test students in different ways, and we want to give them skills that they can use ‘outside’ of the university (or, in case of the research poster, still in academia, but once they have progressed from the student to the researcher role). I would guess that only rarely can a research poster do both effectively. I also have a theory why. I’m currently reading Daniel Keller’s Chasing Literacy – Reading and Writing in an Age of Acceleration. Keller refers to Lester Faigley’s 2006 chapter ‘Rhetorics Fast and Slow’ in Rhetorical Agendas: Political, Ethical, Spiritual, that argued that there are two different rhetorics: a “fast” one and a “slow” one. The slow one is the one we often try to instil in our students for their academic work. I want my students to read deeply, not just skim over the surface of a text, just as I want them to show deep thinking in their essays, which I expect to be re-drafted carefully a number of times. Fast rhetoric – the web-based digital images, blog posts, e-mails, text messages, instant messaging systems, websites – seems to have little room in traditional academia beyond the initial stages of research (although Keller argues that maybe it should). The tradition of the poster is part of the fast rhetoric – posters are promotional tools, they let us know about events or products, they are designed to get their meaning across in the careless glance the passer-by gives them. The research poster attempts to emulate this, but with the burden of trying to get across the slow rhetoric of the academic research project. And this is the problem. Thinking back to the time I designed that first research poster, I knew that if this was to work as a poster, it needed to be short and snappy. It needed to be utilising a fast rhetoric. I could see what would be lost in the translation. So the ideals of the fast rhetoric became replaced by the learning outcomes (this was, after all, an assignment), and a weird hybrid was created, much more like a ‘spineless’ report. We need to be mindful of this. Not just when designing our own research posters for conferences, but also when setting posters as assessments. Should they be part of the assessment mix? Absolutely. But they cannot just be used to replace the report, unless we are happy with the level of detail that would be lost in them. On the other hand, we also cannot judge them in the same way as traditional posters. They are designed by people with different expertise to graphic designers for a different purpose. And that is ok. In Lulu’s workshop we ‘rated’ a number of example posters (that had been done as assessments). As we were all from different disciplines (and because that wasn’t the point), we did not look at the content, but rather at their design, focusing on Impact, Structure and Legibility. When we were done, one of the participants looked at the poster with the highest score and said “but that’s not very creative”. And it wasn’t. It was pretty straight forward. But what it did do was communicating what it was about. It had impact, so that from afar you wanted to step closer and find out more. It was structured well, so you knew where to look and in what order. And it was legible, so that you could actually read the information quickly and easily. Academic research posters shouldn’t be judged by the same criteria than other posters (even if they are prepared by people with a design background), just like they shouldn’t be judged by the same criteria as research reports. Since my first foray into designing research posters (and with the luxury of not having to them to be assessed anymore), my approach to research poster design has changed a bit. I basically design my posters on A4 and then blow them up, thinking that if it isn’t readable on A4, it won’t be readable from a short distance once it is full size at a conference. I also don’t try to put everything in there, this is not my research report or my full paper. If people are interested they can get in touch with me and get more details (if I don’t provide them with all that stuff as a handout anyway). So now I make sure I get my email address on there (which I in the beginning often forgot about) and/or a QR code leading to more information. After Lulu’s workshop I will also have more guidance to get this right and I’m looking forward to putting this into practice. But maybe more importantly, I don’t use research posters as the single assessment of modules I teach. The one I set really is about the ‘Ignite’, and I state clearly to the students that its purpose is for me to see whether they are able to identify the most important aspect of their research – the main thing they want people to know about. And I can do that because the poster isn’t on its own, it comes with a full report of their projects. I think this is the way forward to making research poster design better – including both slow and fast rhetorics into the assessment mix, instead of asking the academic research poster to do both. And I would bet that if we all did this, the posters at conferences would get better in a few years!